Featuring a former contributor to The Trans-Siberian Orchestra, electric violinist Lyris Hung, this new project to which she lends her name is a fascinating one. Featuring her contributions heavily but not exclusively, the music takes the form of an ecletic, melodeath-enhanced progressive metal, melancholic and vicious at once as first track proper Desert shows, although there are also Eastern leanings most notable from beautiful opening instrumental Eos. The two bands that Hung brought to mind to me most obviously were little-known Norwegian prog-deathers She Said Destroy, Hung sharing that band's ability to throw together a chaotic fusion of riffs and melody in a compelling manner, and ex-Emperor legend Ihsahn's solo project, Hung perhaps being more black metal in its frequent use of blastbeats and rasped vocals, yet reminding me of the Norse god nonetheless due to the violin's classical call and that vocalist Dmitry Kostitsyn's clean vocals are quite similar at times. What's clear, however, is that Hung are quite a unique act, the shared similarities being as much in the level of skill rather than direct mimicry. Songs are complex, twisty matters that move with a mind of their own, rarely repetitive or content to rest in one place - consider the nine-minute Progeny with its clattering descending riffs and mid-point instrumental section, traditionally prog in show-off use of instrument yet keeping your attention firmly grasped with a melodic death melody, turning suddenly melancholic and sober as the violin takes the lead. Yet so good is the musicianship and the songwriting that the extra element of the violin might as well not exist, so good are the surrounding elements. This is no gimmick, no 'Violin Metal!' invented subgenre for easy attention in a sometimes all too samey market. Hung have all their musicians focused on the same marvellous goal, and it's a genuine pleasure simply to hear all the instruments, from deep yet audible bass to ferocious and never-stationary guitar (singular! ), firing at once. This isn't quite one of those albums that has its own sound sufficient to elevate it above a mere collection of songs, but it's certainly close. Some will be put off by the harsh vocals that will restrict this in audience, but it's undeniably on the metal side of the prog rock fence, to the extent that it's more melodic death than prog at times - although the opposite also holds true, as you'll hear on the twelve-minute Left For The New Life with its delicate opening and moments of serenity amidst the anger. Evil Tsar is a good entry, full of almost neoclassical riffage and a wild, rapacious anger that doesn't drop in energy even once, but it is only a chapter out of the book, a single song from a brilliant album that also contains such gems as the goth-tinged Matter Of The Blood and riff-tastic finale Sediment Of War. 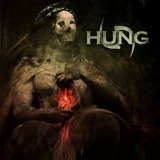 Hung is an excellent opening salvo from this band, a little rough around the edges perhaps, but of no matter due to the sheer quality contained. Future albums will be masterpieces, but this is not far off one. Highly recommended.